With Trine 2 rapidly approaching release, I've decided that I should put this List Of Stuff I Like About Trine 1 out before my perspective is skewed by its sequel (a lesson learned from my as-yet-unwritten discussion of gender representation within Portal 1 - something that has been thrown completely into disarray by a very conflicting presentation in Portal 2). For the uninitiated, Trine is a single player and local co-op action/puzzle platformer in a fantasy setting released in 2009 by Finnish developer Frozenbyte. 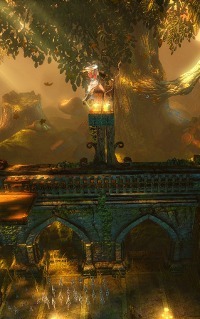 At first glance, Trine's main strength appears to be its outstanding art direction. The game's fantastically lit and surprisingly detailed environments are a wonder to behold. It's not until half way through the game that this becomes apparent as you are taken on a journey that covers dank dungeons whose rusting portcullises and slime covered walls jump and waver in flickering torchlight, fantastical (wow, I never thought I'd actually use that word) forests filled with giant mushrooms and orchids lit by shafts of dappled light filtering down through the canopy, glimmering grottoes where glowing crystal formations illuminate underground waterfalls that seem to go on forever, and remote ruins as late afternoon sun shines through crumbling walls, bringing a regal glow to long abandoned halls. Frozenbyte's attention to detail is astounding, and continues well beyond aesthetics and into mechanics, but I'll come to that in a moment. Atmosphere absolutely permeates this game, and its music and ambient sound effects are definitely as much a part of that as its luscious visuals. Every visual setting has its own theme and arrangement that sets it apart, each of which carries that wonderful quality of not becoming annoying or repetitive. Ari Pulkkinen's score for Trine brings a character and charm that enhances the already majestic environments with its rich and varied melodies. Listening to the soundtrack is a journey in itself as you progress through the game's track listing, with the first act alone taking you from a curious almost mischievous beginning in the Astral Academy and its Hallways to the Wolvercote Catacombs with an air of forgotten honour. Moving onto the second act, the Dragon Graveyard's soaring theme sits next to the Crystal Caverns' quiet beauty, leading into the tragic Crypt of The Damned and purposeful Forsaken Dungeons. Without going through the entire track listing, the most of the rest of the soundtrack is dark, but punctuated with lively pieces, and concludes with an urgent and exciting finale at the game's crescendo. Story wise, Trine isn't particularly deep, but depth isn't exactly a hallmark of fairy tales, so I consider that to be appropriate. The gist of the story is that as the kingdom descends into darkness and is beset by an undead horde, three reluctant heroes inadvertently become bound together by an artifact known as the Trine and must go on a series of move-from-A-to-B quests to free themselves and save the kingdom. There are a couple of minor plotholes/unexplained elements such as why Zoya felt at home in the forest, and why the characters proceeded from some locales to another, but these are in no way distracting or detracting. 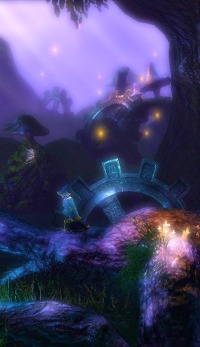 The majority of the story takes place as between-level narration over the top of a storybook style map that shows the player's journey to the level they are about to enter. The game is also book-ended by two cutscenes which consist of slowly panned still images as the story is introduced and concluded. The characterisation of the three protagonists is interesting in that they're all presented as flawed characters; Zoya is more interested in looting than saving the kingdom, Amadeus is vain and insecure, and Pontius' narrow view of reality only seems to extend beyond fighting evil when he's looking for food. This makes for some amusing banter which, whilst shallow, rounds out the characters and helps nudge the story along during gameplay. Moving on to gameplay, playing Trine is definitely reminiscent of (if not inspired by) Blizzard's early puzzle platformer The Lost Vikings. Players control each of the game's three characters one at a time, but unlike The Lost Vikings, the two unused characters are not visible, allowing for a more streamlined experience. Early in the game, Trine's character abilities are quite complimentary. 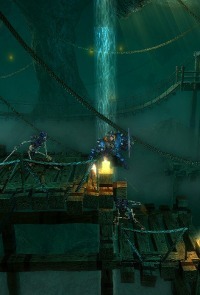 In terms of movement, Zoya's grappling hook allows players to climb to unreachable heights and swing over obstacles where wooden surfaces allow, Amadeus' ability to conjure boxes and levitate objects can give access to places that the grappling hook may not reach, and Pontius can destroy ropes and some environmental elements. As the game progresses, skill upgrades open up a degree of overlap. For example, Zoya's Fire Bow upgrade allows her to destroy ropes and wooden barricades, Pontius' Strength of the Titans upgrade allows him to carry and throw boxes and objects, and Amadeus' Floating Platform upgrade gives him nearly unlimited access to high places. This widens the number of possible approaches to any given puzzle, and lets players feel empowered by allowing them to do more than the 'obvious solution'. Puzzles are crafted from a small palette of well defined elements with predictable behaviour. 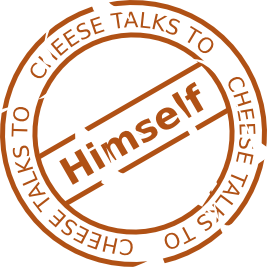 Each of these elements are introduced within safe contexts where its purpose can be readily understood. For example, the first time lava is introduced, a skeleton walks into it and is killed before you are close enough to hurt yourself. Likewise, the first use of a see-saw is to reach a raised platform rather than to cross a sea of spikes. Puzzle elements are kept simple, with complexity instead emerging through implementation and combination. Beyond that, almost all of the puzzles are naturally friendly towards multiple approaches, which I believe represents one of the high points of Trine's game design (but I'm going to touch on why in a minute). By freeing players up to pursue the solutions that come most intuitively to them, Frozenbyte have bypassed the restrictive, directed feel that most puzzle games give whilst still keeping puzzles well balanced, thoughtful and most importantly, challenging without being overwhelming. Fighting is mostly the domain of Pontius, whose blocking abilities allow players to be patient and strategic during melee combat. Zoya's ranged arrows are also essential from time to time, and her ability to swing and kick can be handy for diving into a group. 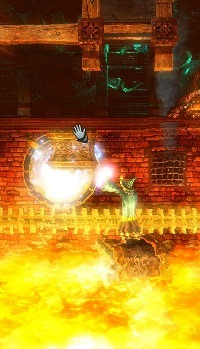 Amadeus's combat abilities are limited to placing obstacles and dropping objects on enemies, but his summoned elements are fairly weak, and levitation takes time, leaving him open to attack. Again, skill upgrades give power and flexibility to Pontius and Zoya, though Amadeus remains fairly useless. That said, I can't envision any changes to the existing mechanics that would not break the balance of the rest of the game and make combat too easy. The enemies you encounter in the game are almost exclusively skeletons. In fact, of the eight enemy types, five of them are skeletons (the other three are environmental flair like bats and spiders in addition to a giant orc boss which is never quite identified). There are sword bearing skeletons which come in two flavours (with shield and without) and skeletal archers, each of which has a tougher version with more hit points that replaces it later in the game. Additionally, there is a fire blowing (that's not a typo - it literally carries a torch around which it uses to ignite its skeletal equivalent of spit) skeleton. The remaining skeleton is a giant boss which seems to be an enlarged copy of the armoured skeletal swordsman with the exception that its only vulnerable area is its face. The most common criticism I've seen of Trine is in regards to its lack of enemy variety, but I believe that this is actually an indicator of one of its greatest achievements. Each enemy has very distinct and identifiable behaviours. The sword wielding skeletons herd the player with melee attacks, the skeletal archers use their bows to force players to find cover, and the fire blowers provide mid-range area denial. With these roles in mind, Frozenbyte have used enemies in the same way they have crafted puzzles, putting predictable elements into complex combinations. The combat challenge comes not from learning new behaviours or fighting tougher enemies, but from responding to new mixes of enemies in new terrain. This approach allows enemies to become part of the puzzles themselves, merging two aspects of gameplay that often remain fairly distinct in other games, and is evidence of a very deliberate and thoughtful hand rather than a lazy one (regardless of restrictions and hurdles during development). Whilst I can imagine that if I played the first few levels and then jumped to the end, I'd be surprised to see the same enemies, there's never a, "Oh, more skeletons?" turning point in the game. There's enough variety in the placement and grouping of enemies that - for me at least - they have not become stale. The game's finale to is an outstanding example of putting learned skills to the test. By introducing a timed element into the game for the first time, the final stream of puzzles and combat, though made from familiar elements, instantly become more challenging, creating a truly satisfying sense of accomplishment. 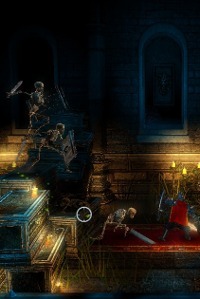 At the conclusion of the game, players are free to play from any level they wish with their upgraded characters, giving the opportunity to play through early levels with very different abilities. Additionally, each level contains secrets and experience vials, and the game has a good degree of scavenger hunt replayability. Sadly, as I don't own a game pad and there is no multiple mouse/keyboard support in the Linux version, I am yet to try local co-op in Trine. If the networked co-op in the Trine 2 beta is any indication though, it is a lot of fun to explore the game with multiple characters using their abilities simultaneously and interesting to see how others approach puzzles that I have solved on my own. Trine may not be everybody's cup of tea, but with its fantastic visuals, gorgeous soundtrack and thoughtful gameplay, it's well worth taking a peek at. Thanks for reading, and a big ultra special thanks to the guys at Frozenbyte who've not only made a wonderful game, but are also wonderful people. 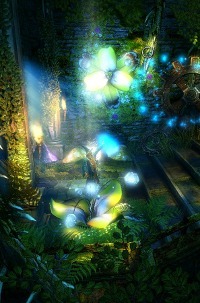 Keep an eye out for my upcoming review of Trine 2. If you're interested in knowing more about the development history of Trine, Gamasutra has a post mortem article that is a great read. Trine is currently available for Windows and Linux on Desura and for Windows and MacOS on Steam. This article was first published on the 3rd of December 2011.